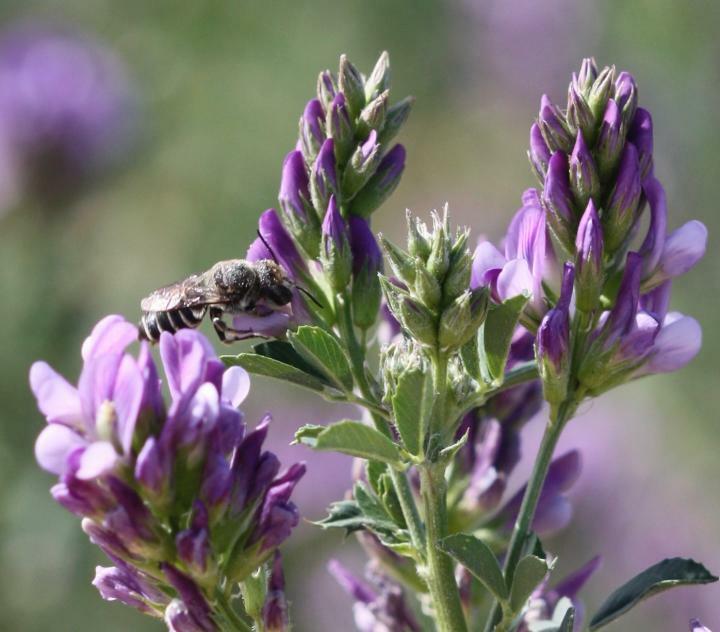 RIVERSIDE, Calif. — A team of researchers at the University of California, Riverside have isolated three previously unknown bacterial species from wild bees and flowers. The bacteria, which belong to the genus Lactobacillus, may play a role in preserving the nectar and pollen that female bees store in their nests as food for their larvae. The results were published Thursday in the International Journal of Systematic and Evolutionary Microbiology. The study was led by Quinn McFrederick, an assistant professor of entomology in UCR's College of Natural & Agricultural Sciences. Symbiotic bacteria that live in bee guts are believed to promote bee health by helping to digest food and boost immunity. Compared to honeybees and bumblebees, little is known about the microbial communities associated with wild bees, despite the important role these insects play in the pollination of flowering plants. Lactobacillus micheneri, named after Charles D. Michener to honor his contributions to the study of bees in natural habitats. Lactobacillus timberlakei, named after Philip Timberlake to honor his work on the taxonomy of native bees, especially at UC Riverside. Lactobacillus quenuiae, named after Cécile Plateaux-Quénu to honor her contribution to our understanding of the social biology of halictid bees. Lactobacilli are often used by humans to preserve dairy products, fermented vegetables and other foods. The study by McFrederick's group suggests the newly identified species may help bees in a similar way, inhibiting the growth of fungi inside pollen provisions. McFrederick's group is currently conducting research to further explore this hypothesis. "Wild bees lay their eggs inside chambers filled with nectar and pollen," McFrederick said. Once an egg has been laid, it may take several days to hatch and an additional week for the larvae to eat through all the nectar and pollen, so it is important that these provisions don't spoil during this period." McFrederick said it is interesting that the bacteria were able to live on both wild flowers and bees. "The species we isolated have fairly small genomes and not as many genes as you would expect considering they survive in two different environments," McFrederick said. The title of the paper is "Lactobacillus micheneri sp. nov., Lactobacillus timberlakei sp. nov., and Lactobacillus quenuiae sp. nov., lactic acid bacteria isolated from wild bees and flowers." In addition to McFrederick, Hoang Vuong and Jason Rothman, students in UCR's Graduate Program in Microbiology, contributed to this research.